Pursuant to Texas state election law, new Voter Registration Certificates are mailed to all "Active Status" registered voters in December of odd numbered years. “Suspense Status” voters do not receive a new certificate. 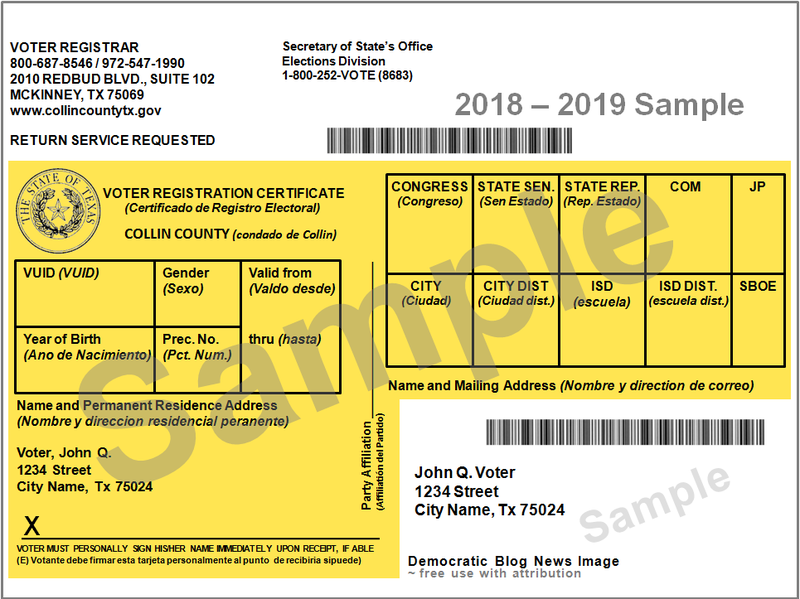 New yellow color certificates were printed by the election registrar office of each Texas county and mailed between November 15th and December 5th. Voters whose renewal certificates are returned to the registrar as undelivered will be placed in "suspense" by January 2, 2018, following the mailing. The certificates are valid for two years beginning January 1, 2018 through December 31, 2019. Certificates must list jurisdictional numbers for seven designated territorial units: Congressional & State Legislative Districts, County Commissioners’, Justice of the Peace precincts and the City and School District precincts, if defined. In addition to the aforementioned, counties may include 3 additional districts for a total of ten jurisdiction. You MUST be registered to vote in the county in which you currently reside, and have a currently dated government issued photo I.D., to vote in any Texas election. You must be registered, or have mailed your registration application to be postmarked, no later than midnight of the thirtieth day before the election date. And, as of the date of this article, you are still required to present photo I.D. at the polling place to vote in person. The last day to register to vote in any election is the 30th day before Election Day. 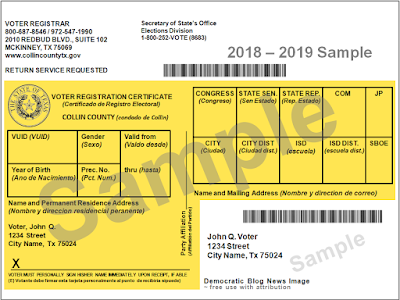 Every registered Texas voter should have received their new 2018-19 yellow Voter Registration Card (VRC) by the first part of January 2018, or within thirty days after you submitted your registration application. If you asked to register to vote while updating your driver's license with the Texas DPS, and you never received a VRC, your registration application may not have been processed. If you have not received a new VRC, you may NOT be properly registered to vote. You should immediately check your registration status and take action to properly register, if you find you are not registered to vote in the county where you reside. To check your Collin Co. registration status - click here. To check your registration status in another Texas county - click here. 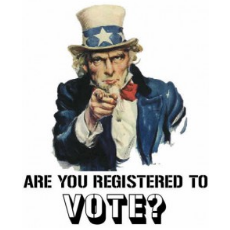 If you find you are not registered to vote, you can find the Voter's Registration application for Collin Co. by clicking here or any county by clicking here. For specific information about voting in Texas, click here to find the Secretary of State’s pamphlet on Texas Voting. Last Thursday, Los Angeles conservative radio host and Fox News Sean Hannity guest regular Leeann Tweeden charged that Franken forced her to kiss him, mistreated her when she rebuffed him, and took a photo with his hands grabbing her breasts when she was asleep—all when they were both touring Iraq and Afghanistan with the USO, entertaining American military personnel, back in 2006. Will Tax Repatriated Earnings Boost American Economy? Brookings Institution: As the Trump administration and Congressional Republicans attempt to overhaul the U.S. tax code, one focal point will be how to “repatriate” the $2.6 trillion of overseas profits accumulated by U.S. corporations. Given how we talk about these earnings, you could be forgiven for thinking U.S. companies have stashed their cash inside a mattress in France. They haven’t. Most of it is already invested right here in the U.S.
To clear up a common misconception, ”repatriation” is not a geographic concept, but refers to a set of rules defining when corporations have to pay taxes on their earnings. For instance, paying dividends to shareholders triggers a tax bill, but simply bringing the cash to the U.S. does not. Indeed, nearly all of the $2.6 trillion is already invested in the U.S.
"When you lose an election with someone who has, say, 40 percent popularity, you look in the mirror and say what did we do wrong?" Schumer said, speaking on ABC's This Week Sunday. "And the No. 1 thing that we did wrong is ... we didn't tell people what we stood for." The simple truth is, Democrats haven't talked much about the fact that America is no longer working the way it should for "We the People" Americans. Democrats haven't been talking about incomes and wages not keeping up with the cost of living. Democrats haven't been talking about wage stagnation, underemployment, the exploding cost of a college education and the erosion of pensions are leaving many without hope. From rural towns to inner cities, Democrats haven't been talking about the millions who can no longer achieve the American dream. Meanwhile, the American people have watched as Washington special interests, millionaires and billionaires at home and foreign, and powerful multinational corporations acquire more and more wealth and power to dominate America's citizens and democratic institutions from local school boards to the federal government. "In the last two elections, Democrats, including in the Senate, failed to articulate a strong, bold economic program for the middle class and those working hard to get there," wrote Senate Minority Leader Charles E. Schumer (D-N.Y.) in a New York Times op-ed. "We also failed to communicate our values to show that we were on the side of working people, not the special interests. We will not repeat the same mistake. This is the start of a new vision for the party." On Monday, House and Senate Democrats unveiled their A Better Deal legislative agenda that will again make America work for "We the People." The "Better Deal" campaign strategy is modeled after the GOP's 1994 "Contract With America" legislative agenda campaign that resulted in Republicans gaining 54 House and 9 U.S. Senate seats. The "Better Deal” message also plays off the title of President Trump’s first and best-known book, “The Art of the Deal.” It is true that Trump has so far shown himself to be one of the worst dealmakers ever to reside in the White House, unable even to get his own party to agree on something it has been promising for seven years, the repeal and replacement of the Affordable Care Act. It is also true that Trump has reneged on all of his populist promises, instead following the standard GOP game plan of tax cuts for the rich and entitlement cuts for everyone else. But if there is one lesson Democrats should have learned from 2016, it is that opposition to Trump is not by itself enough to win elections. If Democrats use the "Better Deal" simply as a stick with which they beat Trump's in ability to close any legislative deal, they could lose more Congressional and state house seats the 2018 midterms. 1) Pharmaceutical companies can without restraint raise the price of lifesaving drugs without justification. Democrats demand rules to stop prescription drug price gouging and further demand drug companies justify price increases to the public. Democrats will also pass legislation to allow and mandate that Medicare negotiate with pharmaceutical companies to lower drug prices for older Americans. 2) Current antitrust laws are designed to allow huge corporations to merge, padding the pockets of investors while sending costs skyrocketing for everything from cable bills and airline tickets to food and health care. Democrats will pass legislation to again level the competitive free market playing field by breaking up corporations that have bought up all their competitors to create single seller market monopolies, and by reinstating FTC and SEC regulations to make sure big multinational corporations can not - through acquisition of all competitors - become a market's single seller of goods and services. 3) There are millions of unemployed and underemployed Americans, particularly those without a college degree. Democrats will pass legislation to foster secure full-time, living wage jobs. Democrats will pass legislation to give employers, particularly small businesses, a large tax credit to train American workers for unfilled jobs. This will have particular resonance in smaller cities and rural areas, which have experienced an exodus of young people who aren’t trained for the jobs in those areas. In the coming months, Democrats will roll out additional legislative agenda proposals, from rebuilding rural America, to guaranteed healthcare availability, to fundamentally changing our trade laws to benefit American workers, not multinational corporations. Mike Collier Officially Announces For Texas Lt. Gov. Incumbent Lt. Gov. Dan Patrick is getting a Democratic challenger when he seeks re-election in 2018. Mike Collier officially announced he is running for the state office at a campaign stop in Round Rock, Texas. A crowd of supporters gathered at the Sharon Prete Main Street Plaza in Round Rock on Saturday, June 17, 2017, to hear Collier announce he will challenge Patrick in 2018. He told the crowd they need a lieutenant governor that will bring Texas together, not apart. Many in Texas Politics consider the lieutenant governor to be the most powerful person in state government because the person holding that office sets the legislative agenda for the state senate. Nothing passes the Texas Senate without the lieutenant governor’s approval. Collier has criticized Patrick for not prioritizing legislation to fix Texas' public school funding, which places heavy property tax burdens on Texas home owners. "We're very different in terms of public education," Collier said Saturday. "I'm pro-public education. I'm pro-teacher and retired teacher and he's not. We have very different points of view in terms of tax policy. I attribute high property taxes to republican fiscal policies. I'll show that on the campaign trail." Collier announced in March of this year he was preparing to run for Texas Lt. Gov. in 2018. At the time, Collier said he planned to travel around the state and listen to voters to gauge support for his campaign before making a final decision to run for the office. 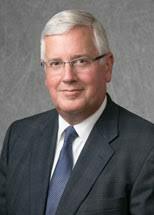 "I will make an official announcement to run when I am confident I can run a winning campaign," Collier said in March. I love Texas and I’m proud to be a Texan. We're no nonsense, we love our families, and we have a generous spirit. We expect our leaders to reflect these values, and when they don't, it's time to make a change. Our Lt. Governor simply isn’t living up to our expectations. Instead of solving problems, bringing Texans together, and showing genuine compassion, he’s playing political games and pitting Texan against Texan. Like you, I’ve had it. That’s why today, I’m assembling a campaign team to run against Dan Patrick for Texas Lt. Governor. I'll be traveling the state, listening to Texans, raising money, building grassroots support, and when I am confident that I can run a winning campaign, I'll make a formal announcement. We need a Lt. Governor that brings Texans together, not an ideologue that chases headlines and drives us apart. Over the last few years, I’ve traveled all over Texas, talking to Texans who love our state and are worried about our future. Texans want someone to fix our broken politics. It starts with sending Dan Patrick back to the radio entertainment business and putting someone serious in charge of the Senate. Collier ran an unsuccessful campaign for Texas Comptroller in 2014, losing to Republican Glenn Hegar in the lowest turnout election since 1942, during WWII. Mike Collier, served the Texas Democratic Party as its finance chairman, from early 2015 to March 2017. He resign that post in March to focus on his campaign for lieutenant governor. Should Collier, a Houston-area resident, win the Democratic nominating primary in March 2018, he will challenge Republican Lt. Gov. Dan Patrick, who was elected to his first term in 2014. Patrick said early this year he would run for re-election in 2018. While the GOP holds a clear advantage in statewide elections, Patrick has become a key lightening rod for Democrats as they focus on the 2018 midterms. Collier says his number one legislative priority as Lt. Gov. will be strengthening Texas' public K-12 schools and universities. His number two priority, which is related to his goal of strengthening Texas' public schools, will be the state's tax policies. Collier says the tax scales in Texas have been tipped to place the mounting burden to fund Texas' public schools on Texas homeowners, as Republicans have increasingly eliminated business taxes paid by corporations doing business Texas. Collier says corporations, who depend on a well educated workforce, should pay their fair share of educating their future work force. Collier's number three priority is corruption. He believes the one-party system in Texas, where Republicans have controlled the state's financial decisions through one party control of the state legislative, executive and judicial branches of government since George Bush was governor, has left the state's public education and transportation systems in decline. Mike Collier joined BlogTalkUSA's Eyes Wide Open DemBlog Talk talk radio program co-hosts Michael Handley and Rheana Rheana Nevitt Piegols on several occasions over the past two years. Listen to these programs to get to know the new candidate running for Texas Lt. Gov. Mike Collier joined BlogTalkUSA's Eyes Wide Open DemBlogTalk co-hosts Michael Handley and Rheana Nevitt Piegols on May 30, 2017 to talk about how his campaign for Texas Lt. Gov. is shaping up. Mike Collier joined co-hosts Michael Handley and Rheana Nevitt Piegols on April 11, 2017 to talk about his just released book, in which Mike relates stories about his experiences running for statewide office in 2014, and traveling the state since talking to Texans. Mike Collier joined co-hosts Michael Handley and Rheana Nevitt Piegols on March 7, 2017 to discuss his decision to run for Texas Lt. Gov. Mike Collier joined co-hosts Michael Handley and Rheana Nevitt Piegols to talk about Texas' state budget and economy on Tuesday, December 8, 2015. After the 2014 election, Mike Collier embarked on a 2015 Texas "listen tour" talking Democrats across Texas for Texas Democratic Party Chair, Gilberto Hinojosa. Mike joined co-hosts Michael Handley and Rheana Nevitt Piegols on a September 2015 program to share what he learned on his listening tour. Senator Bernie Sanders recorded a 14-minute long video response to President Trump’s first address to a joint session of Congress Tuesday night. He also brought up the numerous contentious town halls that took place across the country recently. Watch former Kentucky Gov. Steve Beshear deliver the "official" response to President Trump's first address to a joint session of Congress for the Democratic Party. The Affordable Care Act (ACA) not only provides affordable access to health insurance for working-age Americans and their families, it also provides older Americans covered by Medicare and Medicaid a list of additional covered benefits. The ACA, a.k.a.Obamacare, improved Medicare coverage, boosted taxes and reduced program spending. Older Americans on Medicaid also would face a significant loss of benefits, because any effort to repeal Obamacare would affect the law’s major expansion of Medicaid, including how Washington pays states for administering the program. Good health does cost money, of course, but so does having to treat people who have not been taking care of themselves. Perhaps all of these measures would survive the repeal process. However, considering that some of these benefits might disappear, Medicare enrollees ought to work with their doctors right now to make sure they’re taking full advantage of these wellness benefits. Another main Obamacare feature has been its reduction in out-of-pocket spending in Part D Medicare prescription drug plans. This has been accomplished through the elimination of the so-called “donut hole” by 2020. Medicare says enrollees have saved more than $2,000 per person, on average, because of this single change. It’s quite possible, of course, that the donut hole will be totally gone by the time the “replace” components of “repeal and replace” actually have taken effect. Given the shouts from both parties about high drug prices, it seems unlikely that Republicans would have much appetite for being tagged with efforts to make people spend more money on prescription medicines. Obamacare’s other big Medicare impact came via financial improvements it put in place to help the program. It raised a bunch of taxes, including requiring high-income wage earners to pay higher Medicare payroll taxes and stiff premium surcharges for Medicare Part B and D premiums. Health providers and Medicare Advantage insurance plans were also willing to accept lower payment levels from Medicare in exchange for the law’s provisions that would expand their access to more insurance customers. Before the passage of the ACA, the Medicare trust fund that pays claims for Part A hospital and nursing home expenses had been projected to run short of funds by 2017. The ACA has pushed that date out more than 10 years. Republicans reportedly want to do away with many of these taxes. Unless other funding streams are created to replace them, the longer-term finances of the program would be at greater risk. Ironically, these actions would “force” Republicans to cut health care spending to curb runaway deficits. As actual GOP plans come into sharper focus, sharp Medicare battle lines will form for politicians and the public alike. Expect the proposals to come coated in friendly sounding packages that tout health care improvements. But it will be crucial to look inside the packages to get an understanding of whether the Medicare program that would emerge from their enactment is one you want to have. What's going to happen to 70 million Americans who rely on Medicaid? New Hampshire Democratic Party Chairman Ray Buckley announced Saturday he has decided to withdraw his bid to be the Democratic Party's next national chairman and back Minnesota Rep. Keith Ellison to lead the party. "While it was a tremendous honor to run for DNC Chair over the past few months, I am proud to throw my support behind Keith so we can ensure that the next Chair of the DNC is dedicated to investing in and strengthening state parties and ensuring that the DNC is an accountable organization," New Hampshire Democratic Party Chairman Ray Buckley said in a statement today. "As I've talked to the DNC membership, it's clear Keith has widespread support, and I know as our next DNC Chair Keith will successfully unite and grow our party." Ellison has the backing of many Democratic Party leaders, including U.S. Senate Minority Leader Chuck Schumer, U.S. Senators Elizabeth Warren (MA), Tammy Baldwin (WI), Amy Klobuchar (MN), Al Franken (MN), and numerous other party leaders including members of Congress and state Democratic Party leaders. CNN announced Friday it will host a debate next week for the candidates running for chairman of the Democratic National Committee. The event in Atlanta is being called "Debate Night: Democratic Leadership Debate" and is scheduled for Wednesday at 10 p.m. ET, just days before Democratic officials vote on a new chairman at the DNC's meeting in the same city Feb. 23-26. "CNN chief political correspondent Dana Bash and New Day anchor Chris Cuomo will moderate the primetime event live from the CNN Center in Atlanta, Georgia just days before the Democratic Party chooses a new national leader," the network said in a press release. "The candidates will debate their visions and strategies for the 2018 midterm elections, how to rebuild the Democratic Party and the role of the DNC under the Trump administration." Since mid-January, the DNC chair candidates have participated in four "DNC Future Forums," the last of which was last weekend, as well as several additional forums host by various activist groups. The Democratic National Committee (DNC) held it's fourth and final regional day long 'Future Forum' in Baltimore last Saturday, in advance of its February 23rd-26th meeting to elect new party leadership. As with the first three forums, DNC Chair candidates, DNC members, guest speakers, and other Democrats discussed how the party goes forward after losing to Republicans, over the last 8 years, more than 1,000 state and federal level legislative and executive branch seats held by Democrats. When they meet on February 23–26, 2017, the 447 members of the Democratic National Committee will elect a new Chairperson and other party officers. The DNC chairperson candidates offered opinions during their 90 minute discussion forum on why over 1,000 of the party's incumbent office holders lost elections to Republicans during the 2010 - 2016 election years. Republicans in the House (Tea Party) Freedom Caucus voted among themselves Monday night to band together and support only a 2017 Affordable Care Act (ACA) "Obamacare" repeal bill that is at least as comprehensive as the repeal bill passed by the Republican controlled House and Senate in 2015. “If it’s less than the 2015 [bill], we will oppose it,” Freedom Caucus Chairman Mark Meadows (R-N.C.) told a small group of reporters Monday night. By insisting the 2015 repeal bill effectively be copied as the initial 2017 repeal bill, the GOP again confirmed the party's hard line intent to repeal affordable healthcare for millions of Americans. The 2015 ACA repeal bill was passed by the Republican controlled House and Senate in late 2015, but was not signed by President Barack Obama when it reached his desk in January 2016. Affordable Care Act (Obamacare) Repeal Bill of 2015 (December 7, 2015 @ healthaffairs.org). Polar weather has been far warmer this winter than any winter on record, shocking scientists who are watching sea ice volume decline to record lows for the date. Winds have driven large amounts of the oldest ice out of the Arctic while the weather has been far too warm for months for the ice to thicken like it normally does by February. 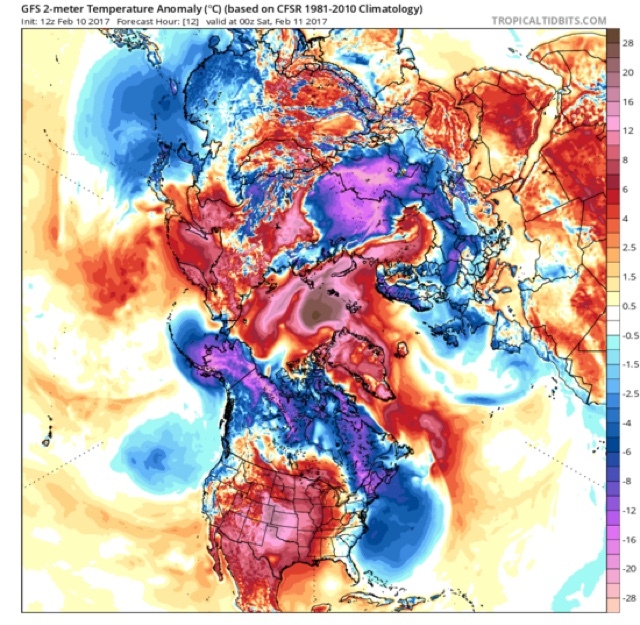 And now the north pole is fifty degrees F above normal. Again. AARP: Fifty-five million working Americans do not have a way to save for retirement out of their regular paycheck. With many American workers anxious about their financial security, there is strong support among conservatives and private sector workers for policies that would make it easier for workers to save for retirement, according to a new AARP survey. The nationally representative survey of private sector workers ages 18-64 shows that 8 in 10 (80%) support state-facilitated plans designed to help employees save their money for retirement. There is also broad agreement among American workers of all races, ethnicities, and political ideologies that elected officials should help small businesses offer their employees an easy way to save for retirement. Three in four (74%) private sector workers feel very or somewhat anxious about having enough money to live comfortably through their retirement years. Just a quarter say they are not anxious. Anxiety is high among all racial groups, with large majorities of Latinos (77%), whites (74%), African Americans (73%), and Asian Americans (70%) all saying they are anxious they will not be able to financially support a comfortable retirement. Eighty-three percent (83%) agree elected officials should do more to make it easier for workers to save for retirement. Eighty-one percent (81%) of political conservatives agree that elected officials should do more to make it easier for workers to save for retirement, as do eighty-six percent (86%) of moderates, and eighty-nine percent (89%) of liberals. Eighty-four percent (84%) of private sector workers age 18-64 say elected officials should make it easier for small businesses to offer their employees a way to save for retirement. Seventy-six percent (76%) or three in four political conservatives agree that elected officials should make it easier for small businesses to offer retirement plans to their employees, as do about four in five moderates (85%), and liberals (90%). This survey was conducted by NORC at the University of Chicago with funding from AARP. Data were collected using AmeriSpeak®, NORC’s probability-based panel designed to be representative of the U.S. household population including the 50 states and the District of Columbia, and a supplemental address-based sample from TargetSmart. Interviews for this survey about retirement security were conducted online and via phone between November 1, 2016, and January 16, 2017, with 3,920 adults ages 18-64 employed in private sector industries. Interviews were conducted in English, Spanish, Korean, Vietnamese, and Chinese. NY Magazine: "The Republican Party, faced with the catastrophic real-world consequences of repealing the Affordable Care Act, is divided over how to proceed. Some nervous Republicans want to figure out what they want to put in place of Obamacare. But when people find out what Republicans plan to put in place of Obamacare they will see the Republican "Repeal and Replace" ads were less than empty promises. It's time for Democrats to promise their "replacement" for Obamacare - Medicaid for All. Medicare is FAR less wasteful than private insurance. Congressman John Conyers (D-MI) has introduced his bill, The Expanded and Improved Medicare for All Act," in every Congress since 2003. It is co-sponsored by more than 50 Members of Congress and support continues to grow. If Republicans want to repeal and replace Obamacare, tell them to replace it with Medicare for All. Rep John Conyers: "Half a century ago, addressing the convention of the Medical Committee for Human Rights, Martin Luther King Jr. declared, "Of all the forms of inequality, injustice in health care is the most shocking and inhumane." "I strongly agree with Dr. King, which is why I have been a firm supporter of President Obama’s landmark Affordable Care Act (ACA). The ACA has resulted in 17.6 million uninsured people gaining health coverage as the law’s coverage, and minorities have seen the largest increase in insurance coverage: About four million Latino adults gained coverage, an 11.5% drop in the uninsured rate, while nearly three million African-Americans gained insurance, a 10.3% reduction. Another seven million white adults became insured, representing a 6% drop. But there is still much more to be done to eliminate injustice in health care in the United States, while making our system more cost-efficient. The United States still spends almost twice as much per person on health care as any other country, yet our key outcomes – life expectancy, infant mortality and preventable deaths – too often lag behind our peers. A recent Commonwealth Fund study ranked the U.S. healthcare system dead last among 11 highly developed countries in terms of quality, efficiency and access to health care. That is why I am leading the charge in the House of Representatives for single-payer, universal healthcare system. By implementing a “Medicare for All" system – the standard for health care throughout the industrialized world – we can achieve hundreds of billions of dollars in cost savings that can be used to cover the nation's remaining uninsured and upgrade coverage for millions of underinsured citizens. More and more people across the country understand that a single-payer healthcare system is the only way to guarantee quality care and at the same time reduce medical costs. 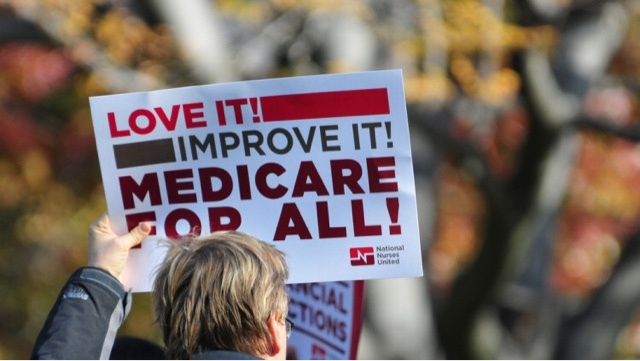 A poll from [date] showed that more than half of Americans -- including 80 percent of Democrats and a quarter of Republicans -- support expanding health reform to "Medicare for All." That is why I have introduced my bill, The Expanded and Improved Medicare for All Act, in every Congress since 2003. It is co-sponsored by more than 50 Members of Congress and support continues to grow. " Senators Bernie Sanders and Ted Cruz debated the future of health care in the US Tuesday night. The town hall debate highlighted some of the issues surrounding the GOP's committment to repeal the Affordable Care Act -- a sweeping health care law that diectly covers some 20 million Americans as well as who have health insurance through their employers. The evening began with each lawmaker laying out starkly different views of the controversial law. "If you are one of 20 million Americans who finally has received health insurance, forget about it -- you're gone," Sanders warned about repealing Obamacare. "That means when you get sick, you ain't gonna be able to go to the doctor. And when you end up in the hospital, you'll be paying those bills for the rest of your life, or maybe you'll go bankrupt." Cruz, a Texas Republican who made his name in national politics by fiercely opposing the health care law, said former President Barack Obama made a series of promises that were broken. "If you like your doctor, you can keep your doctor ... Millions discovered that was not true," Cruz said. Democrats Framing The Story Of Us? If any number of things had gone the other way — James Comey, Russian interference, a less distrusted nominee — the Democrats might now be starting their third straight term in office. And of course Hillary Clinton did win the popular vote, by no small margin. So I understand why many sober Democrats have urged the party not to exaggerate the political lessons from the 2016 election. But it would also be a mistake to underreact. Presidential politics are, by far, the party’s strong suit — and it still couldn’t beat Donald Trump. In addition to the White House, Republicans hold the House, the Senate and about two out of every three governorships and state legislatures. LATimes: Politicians aiming to cut Social Security and Medicare use weasel words to hide their plans. Let's call them on it. 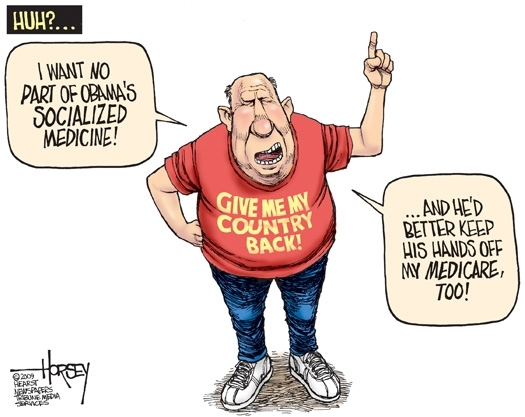 In this era in which the Orwellian manipulation of language by politicians to say the opposite of what they mean has reached a fever pitch, we should be especially wary when conservatives hide their plans to cut Social Security and Medicare benefits behind a smokescreen of euphemism. Jared Bernstein, a fellow at the Center on Budget and Policy Priorities and a former chief economist to Vice President Joe Biden, has put in a plea to journalists to call out policy makers when they pull this stunt—and not to empower politicians by doing the same thing. Read the full story at the LATimes. The Democratic National Committee (DNC) held it's third of four 'Future Forums' in Detroit Saturday, giving DNC members and other Democrats a chance to speak about how the party goes forward after losing to Republicans, over the last 8 years, more than 1,000 state and federal level legislative and executive branch seats held by Democrats. When they meet on February 23–26, 2017, the 447 members of the Democratic National Committee will elect a new chair. Regional forums with DNC chair candidates have already been held in Phoenix and Houston, and another forum is scheduled for Feb. 11 in Baltimore. Click here to view the recorded live streams of the Detroit, Phoenix and Houston forums. United Steelworkers Local 1999 President Chuck Jones told attendees of the Detroit Future Forum gathering of Democrats Saturday working class Americans need to be brought back in the fold of the party, arguing that President Donald Trump convinced many likely Democratic voters to switch sides in 2016. Republicans working to repeal the Affordable Care Act are working to stick it to one of the most important voting blocks within the GOP base - Senior Citizens. Based on exit polling, many of the demographics that would be hit hardest by the repeal voted for Trump in the presidential election. A sizable minority of Americans don’t understand that Obamacare is just another name for the Affordable Care Act, according to a Morning Consult survey. In the survey, 35 percent of respondents said either they thought Obamacare and the Affordable Care Act were different policies (17 percent) or didn’t know if they were the same or different (18 percent). This confusion was more pronounced among people age 18 to 29 and those who earn less than $50,000 — two groups that could be significantly affected by repeal. Among Republicans, a higher percentage (72 percent) said they knew Obamacare and the A.C.A. were the same, which may reflect the party’s longstanding hostility to the law. Though Republicans were more likely to know that Obamacare is another name for the A.C.A., only 47 percent of them said expanded Medicaid coverage and private insurance subsidies would be eliminated under repeal (compared with 79 percent of Democrats), while 29 percent said Medicaid and subsidies would not be affected and 24 percent said they didn’t know. A large block of Republican voters do not understand repealing Obamacare will affect the popular provisions of the A.C.A. AARP is working to change that political equation. AARP, the nation’s largest organization of senior citizens, with a membership of 38 million older Americans age 50 and older, announced Monday it was launching a comprehensive campaign to protect Medicare and Medicaid from the GOP's chopping block. Repealing "and replacing" the Affordable Care Act also takes big bites out of Medicare and Medicaid. The GOP's wish list for radical restructuring America's Social Security, Affordable Care, Medicare, and Medicaid benefit programs will literally destroy the quality life earned by America's retired seniors. Here are just two examples of how the GOP's restructuring goals will hit seniors hard with their repeal and replacement of the Affordable Care Act. One of those proposals would relax or eliminate the ACA’s “age bands” cap. The other would transform Medicaid into a so-called block grant. Robert Reich isn’t the only person to notice that the Democratic Party is in dire straits. All the Democrats in the running to be the Democratic Party's next leader are saying it too. The former Secretary of Labor and UC Berkeley professor wrote an op-ed in the San Francisco Chronicle to confront the party with seven hard truths. His conclusion, if they don’t deal with these realities, is harsh: a third party is going to form that will replace them. 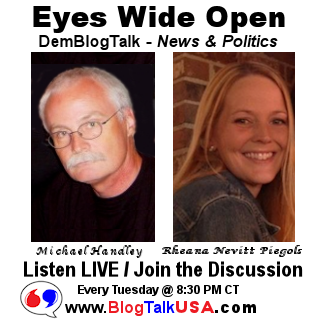 Listen to this week's BlogTalkUSA.com "Eyes Wide Open DemBlogTalk" talk radio program cohosts Rheana Nevitt Piegols and Michael Handley and their guest Bruce Horst discuss affordable healthcare as the moral choice for Christians. With Republicans about to repeal the Affordable Care Act — labled Obamacare by Republicans — Bruce steps forward from the ranks of Christian Evangelicals to say his fellow Evangelicals have driven him from the church over their stance Christians must oppose legislation that extends healthcare to the poor and children and other Americans denied healthcare because of financial barriers or preexisting health conditions. Bruce Horst, a former Conservative Evangelical Christian from Texas, caught our interest when he took to Facebook about 2 weeks ago to brilliantly call out his former Conservative Evangelical Christian brethren for cheering the idea of 20 million people losing their health insurance! You will not want to miss this interview that starts at the 30 minute time mark of the recorded program! As David Brock attempts to position himself as a leader in rebuilding a demoralized Democratic Party in the age of Trump, many leading Democratic organizers and operatives are wishing the man would simply disappear. Brock’s political evolution is well-known: the former anti-Clinton right-winger who starting in the late 1990s transformed into a relentlessly pro-Clinton Democratic operative who operates Media Matters for America as well as the American Bridge and Correct the Record super-PACS. Brock's Correct the Record PAC operation coined and pushed the "Bernie Bros" bashes against supporters of Senator Bernie Sanders' presidential campaign, trolling them with that meme on social media. Clinton's supporters quickly shared Brock's Bernie Bros memes, virally pushing them into the primary's discourse. Brock's PAC operation also published opposition articles and ads against Sanders and Donald Trump's GOP opponents during the 2016 primary cycle. Some of the "bad blood" still circulating between Sanders and Clinton supporters tracks back to Brock's less than factual negative attack campaign against Sander and his "Bernie Bros" followers during the primary. Another of Brock's primary goals was to help Trump win the GOP nomination on the theory Trump would be the weakest general election candidate against Clinton. The friction between Brock and Democrats is widespread among alumni of Senator Bernie Sanders' and President Obama’s campaigns and White House, as well as Hillary Clinton’s failed 2016 run. They all say they want Brock to stay far away from the Democrats’ future plans. “I don’t think David Brock has been helpful to the party to date, and I don’t think he will be a big part of its future,” a former senior Clinton campaign official told The Daily Beast. Bottom line, what Democrats across the board seem to be saying about David Brock is, with friends like him, who needs enemies. The Affordable Care Act expanded Medicare's prescription drug benefit. Before the ACA, people on Medicare had to deal with a gap in that insurance coverage that came to be known as the doughnut hole. That's the point at which Medicare would stop paying part of the cost of drugs, and beneficiaries would have to buy them at full price. Then, when the patient's out-of-pocket costs reached a level deemed to be "catastrophic," Medicare would start paying most of the cost of the drugs again. A 2011 study from the Kaiser Family Foundation showed that when patients had to pay full price, they'd skip some of their prescribed medications — and that could, potentially, result in sicker patients and higher costs for Medicare. Gradually, the ACA has been closing the doughnut hole coverage gap. According to the Center for Medicare and Medicaid Services, beneficiaries have saved more than $23.5 billion in prescription drug costs. It's unknown if this program would be maintained in a Republican plan that replaces the ACA. Medicaid is commonly thought of as the program that provides health care for the poor. But it also pays for long-term care for a lot of older people, including the majority of nursing home residents. One idea in some of the Republican proposals for replacing the Affordable Care Act is to turn Medicaid from a guaranteed benefit into a block grant to states. States would get a fixed amount of money from the federal government, and could make their own decisions on how to spend it. That's an idea that's been popular for some time among conservatives such as House Speaker Paul Ryan. They argue that states know their needs better than Washington does, and the block grant would give states flexibility in meeting those needs. Critics fear this could do away with many protections that federal law currently provides for vulnerable older people. They also worry about what might happen in an economic downturn, when the demand for Medicaid goes up, but the amount of federal money allocated for it stays the same. For example, would states have to choose between cutting services for poor children versus cutting programs for the frail elderly? Before the Affordable Care Act, insurance companies could charge people in their 50s and 60s many times more than they'd charge a younger person for the same policy. The affordable care act put a limit on that. Now Insurance companies can only charge older people three times as much as they charge people a few decades younger. But the various GOP replacement proposals either set higher limits — five or six times higher — or they don't have any limits at all. A study sponsored by the Rand Corporation and the Commonwealth Fund found that if older Americans were charged five times more for insurance than younger people, about 400,000 would no longer be able to afford to buy health insurance. The Washington Post has obtained a secret recording of a closed-door meeting between Republican lawmakers – and it reveals them expressing serious doubts about how they are going to live up to their promises to the American people of getting rid of Obamacare, while at the same time initiating a replacement without creating chaos. In the recording, a number of concerns were raised, but chief among them was how they were going to do this in a way that wouldn’t hurt them when the next election comes up. What’s most striking about the conversations, however, was that key Republicans admitted that they didn’t know what to do as far as a replacement plan is concerned. Democrats who are having trouble moving on from the first stage of grief — denial — over Hillary Clinton's loss to Donald Trump still defend the loss by saying, "but Clinton won by 2,864,974 votes nationwide, even if she did lose the electoral college vote." But a critical look at the numbers reveals a national problem for Clinton, and Democrats in general. Clinton’s 2.86 million-vote edge came from but 489 of our 3,144 counties. In 2016, 209 of the 676 counties that cast majorities for Obama in both 2008 and 2012 backed Trump, many in the Midwest. The space between is best measured by economics. The 16 percent of counties supporting Clinton account for 65 percent of our GNP, and their median home price is 60 percent higher than in counties carried by Trump. The state that gave Trump his largest margin of victory was Texas, where he beat Clinton by only 807,179 votes out of 8,969,226 total votes cast. While Trump won 30 states, his margin of victory ranged from less than 100,000 votes up to just over five hundred thousand votes, state by state, except for Texas and his 642,000 vote margin in Tennessee. Clinton won 21 states, including DC, but her margin of victory in the states she won was not as good as Trump's victory margin, in the states he won. Clinton's national vote lead comes from seven states where she won very out-sized victories over Trump. These seven states, topped by California, allowed Clinton to run up her popular vote victory by 2,864,974 votes. In fact, Clinton loses by 1.4 million votes when California's vote tallies aren't included as part of the national aggregate of votes. California is the only state where Clinton's margin of victory was bigger than President Obama's in 2012 — 61.5% vs. Obama's 60%. Clinton got 6% more votes than Obama did In 2008, but the number of registered Democrats in the state climbed by 13% over those years. What's more telling is the GOP won almost all of the swing state Senate elections, including a robust showing in the diverse swing state of Florida, and a blowout in crucial Ohio. In the U.S House distributed national aggregate of votes, Republicans topped Democrats by more than 2.7 million votes, nearly equaling Hillary Clinton's national popular vote total. Clinton's 2016 loss culminates a trend of losses for Democrats over multiple election cycles. Democrats lost another net 43 seats in legislatures across the country in 2016, after previously losing 910 seats during Obama's administration. 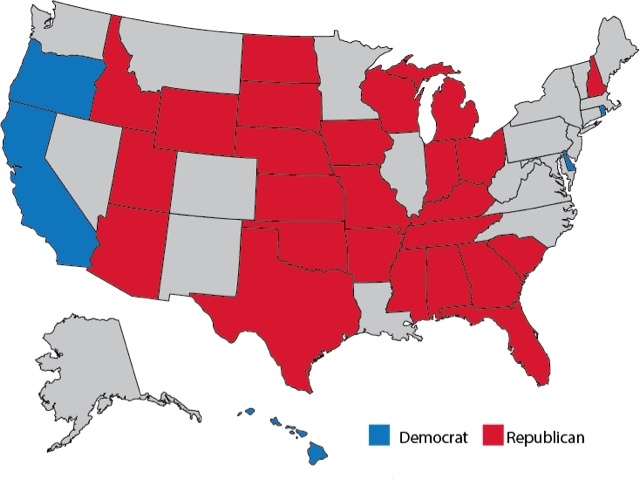 Republicans added to their historic 2014 gains in the nation’s state legislatures with the addition of five state House chambers and two state Senate chambers in 2016. The economically ascendant counties Clinton won, largely urban and suburban, are geographically isolated. Democrats occupy archipelagos — islands of the relatively privileged surrounded by what has become, to them, an unknown largely rural land, in which less educated and more aggrieved voters dog paddle to survive. The counties that switched their votes from voting twice for Obama to Trump were far smaller, whiter, and slower-growing than the rest of the Obama coalition. The population of counties that flipped to Trump was 78% white. But individual voters in those counties that flipped didn't switch from Obama to Trump, for the most part they just didn't vote for Clinton or they voted for a third party presidential candidate. The growing economic disparity among voters aggravates a growing “despair gap” of in equality. A study by the Center for American Progress found a direct correlation between the percentage of “underwater” homes and counties that voted for Trump. Similarly, a sociology professor at Penn State found Trump fared better in counties where the mortality rates caused by drugs, alcohol, and suicide were highest. What issued from Trump’s America was a desperate and angry cry for economic help. After the 2016 election, Republicans are now in control of a record 67 (68 percent) of the 98 partisan state legislative chambers in the nation, more than twice the number (31) in which Democrats have a majority, according to the bipartisan National Conference of State Legislatures (NCSL). Republicans hold more total state legislative seats in the nation, well over 4,100 of the 7,383, than they have since 1920. Democrats now have total control of just 13 state legislatures. Republicans gained 2 more states' governor-ships in 2016, after already gaining 12 over the last 8 years, increasing its total to 33, a record high last seen in 1922. Democrats had also lost 69 US House seats and 13 US Senate seats since 2009 and barely managed to stem further losses in 2016, with only a net two seat gain in the U.S. Senate resulting in a 52-48 Republican majority, and net six seat gain in the U.S. House, resulting in a 241-194 Republican majority. Some blame James Comey and the FBI. Some blame voter suppressionand racism. Some blame Bernie or bust and misogyny. Some blame third parties and independent candidates. They will blame the corporate media for giving him the platform, social media for being a bullhorn, and WikiLeaks for airing the laundry. But this leaves out the force most responsible for creating the nightmare in which we now find ourselves wide awake: centrist neoliberalism. That worldview – fully embodied by Hillary Clinton and the Democratic Party – is no match for right wing extremism. The choice to follow the neoliberal centrist policy strategy is what sealed our fate to losing more than 1,000 elected office seats to Republicans. If we learn nothing else, can we please learn from that mistake? Here is what we need to understand: a hell of a lot of people are in pain. 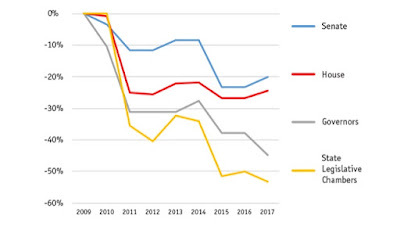 Under neoliberal centrist policies of deregulation, privatisation, austerity and corporate trade, their living standards have declined precipitously. They have lost jobs. They have lost pensions. They have lost much of the safety net that used to make these losses less frightening. They see a future for their kids even worse than their precarious present. At the same time, they have witnessed the rise of the Davos class, a hyper-connected network of banking and tech billionaires, elected leaders who are awfully cosy with those interests, and Hollywood celebrities who make the whole thing seem unbearably glamorous. Success is a party to which they were not invited, and they know in their hearts that this rising wealth and power is somehow directly connected to their growing debts and powerlessness. For the people who saw security and status as their birthright – and that means white men most of all – these losses are unbearable. Donald Trump speaks directly to that pain. The Brexit campaign spoke to that pain. So do all of the rising far-right parties in Europe. They answer it with nostalgic nationalism and anger at remote economic bureaucracies – whether Washington, the North American free trade agreement the World Trade Organisation or the EU. And of course, they answer it by bashing immigrants and people of colour, vilifying Muslims, and degrading women. Elite neoliberalism has nothing to offer that pain, because neoliberalism unleashed the Davos class. People such as Hillary and Bill Clinton are the toast of the Davos party. In truth, they threw the party. Trump’s message was: “All is hell.” Clinton answered: “All is well.” But it’s not well – far from it. Neo-fascist responses to rampant insecurity and inequality are not going to go away. But what we know from the 1930s is that what it takes to do battle with fascism is a real left. A good chunk of Trump’s support could be peeled away if there were a genuine redistributive agenda on the table. An agenda to take on the billionaire class with more than rhetoric, and use the money for a green new deal. Such a plan could create a tidal wave of well-paying unionised jobs, bring badly needed resources and opportunities to communities of colour, and insist that polluters should pay for workers to be retrained and fully included in this future. It could fashion policies that fight institutionalised racism, economic inequality and climate change at the same time. It could take on bad trade deals and police violence, and honour indigenous people as the original protectors of the land, water and air. People have a right to be angry, and a powerful, intersectional left agenda can direct that anger where it belongs, while fighting for holistic solutions that will bring a frayed society together. Such a coalition is possible. In Canada, we have begun to cobble it together under the banner of a people’s agenda called The Leap Manifesto, endorsed by more than 220 organisations from Greenpeace Canada to Black Lives Matter Toronto, and some of our largest trade unions. Bernie Sanders’ amazing campaign went a long way towards building this sort of coalition, and demonstrated that the appetite for democratic socialism is out there. But early on, there was a failure in the campaign to connect with older black and Latino voters who are the demographic most abused by our current economic model. That failure prevented the campaign from reaching its full potential. Those mistakes can be corrected and a bold, transformative coalition is there to be built on. That is the task ahead. The Democratic party needs to be either decisively wrested from pro-corporate neoliberals, or it needs to be abandoned. From Elizabeth Warren to Nina Turner, to the Occupy alumni who took the Bernie campaign supernova, there is a stronger field of coalition-inspiring progressive leaders out there than at any point in my lifetime. We are “leaderful”, as many in the Movement for Black Lives say. So let’s get out of shock as fast as we can and build the kind of radical movement that has a genuine answer to the hate and fear represented by the Trumps of this world. Let’s set aside whatever is keeping us apart and start right now. Click here for certified results for all 50 states and Washington D.C.
Who Put Trump in the White House? Kim Moody, a co-founder of Labor Notes and author of “In Solidarity: Working-Class Organization and Strategy in the United States,” published a tough critique of Democratic mistakes and misguided strategy, beginning long before 2016, in a Jacobi Magazine article, "Who Put Trump in the White House? The Democratic Party has been collapsing for years, but no one noticed before Trump came along." “While there was a swing among white, blue-collar and union household voters to Trump, it was significantly smaller than the overall drop in Democratic voters,” writes Moody. Moody blames a reduction in direct door-to-door human contact campaigning with lower-income voters in favor of purchased media forms of campaigning, including TV ads, for falling turnout for Democrats. Democrats purport to be the party that champions improved living standards for working people, but they have been unable to deliver in recent years, owing increasingly to the Republican’s strategy of all-out obstruction. Moody explains “centrist liberalism” is a doomed philosophical foundation for Democrats because it is associated with the Party’s failure to produce needed economic reforms. Many in the Democratic Party are coming to grips with the reality that voters increasingly reject centrist public policies Democrats have been promoting, legislating, and campaign on for two decades. Democrats lost another net 43 seats in legislatures across the country in 2016, after previously losing 910 seats during Obama's administration. 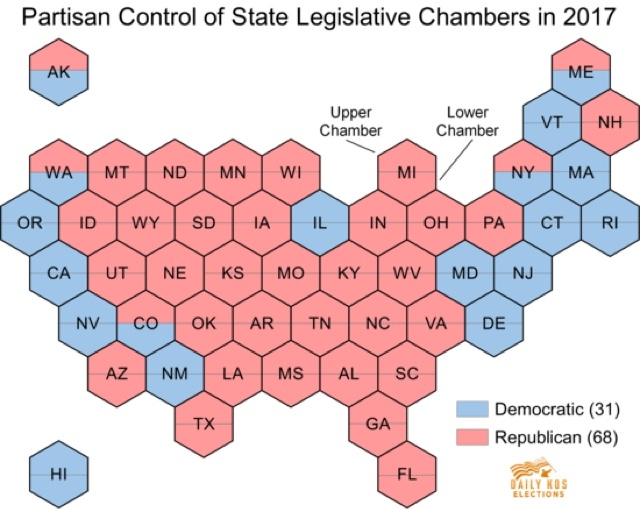 Republicans added to their historic 2014 gains in the nation’s state legislatures with the addition of five state House chambers and two state Senate chambers in 2016. Republicans are now in control of a record 67 (68 percent) of the 98 partisan state legislative chambers in the nation, more than twice the number (31) in which Democrats have a majority, according to the bipartisan National Conference of State Legislatures (NCSL). Republicans hold more total state legislative seats in the nation, well over 4,100 of the 7,383, than they have since 1920. Democrats now have total control of just 13 state legislatures. Republicans gained 2 more states' governor-ships in 2016, after already gaining 12 over the last 8 years, increasing its total to 33, a record high last seen in 1922. Democrats had also lost 69 US House seats and 13 US Senate seats since 2009 and barely managed to stem further losses in 2016. Moody concludes, "Democrats are going to need a much bolder economic strategy that acknowledges the failures of the past and points the way to a more robust advocacy of the kind of economic agenda that empowered the campaign of Sen. Bernie Sanders. Democrats should not allow the Trump Administration to claim ownership of a massive investment in infrastructure upgrades and twist it into another corporate raid on the federal treasury. Instead, revitalizing America’s crumbling infrastructure should be the signature project of the Democratic party, and protecting the integrity of it, is the central challenge of the next few years." Political marketing has become a growing facet of marketing that has infiltrated the campaigning of U.S. presidential elections. Within this cognate of marketing, social media has become a major component of predicting election outcomes starting with the 2008 U.S. presidential election. 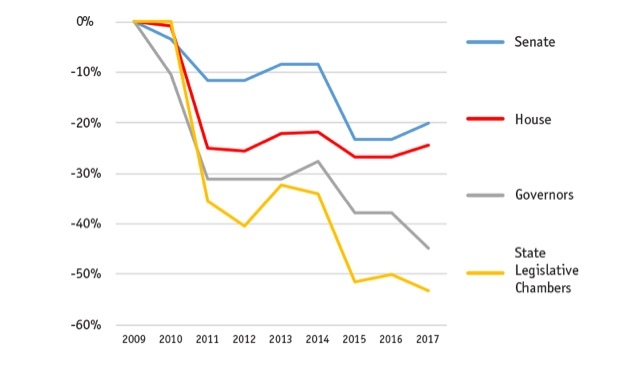 An analysis of the social media performance of candidates from the 2008 to 2016 U.S. presidential elections reveals how the power of social media can be harnessed to increase voter participation, connect voters to offline political activity, and engage voters with candidates on a more personal note. Social media political marketing should further emphasize the candidate’s brand and build followership through targeted messaging to desired segments. Social media continues to grow in use and bypass direct news sources; therefore, it must complement and create a dialogue with traditional media, as it will likely surpass it someday. Listen to BlogTalkUSA.com "Eyes Wide Open DemBlogTalk" talk radio program cohost Rheana Nevitt Piegols and special guest cohost for the evening Texas Young Democrat Michael Messer discuss standardized testing in Texas public schools, charter school vouchers and much more... Program recorded live on Tuesday January 24th, at 8:30 PM CST. A standardized test is a test that is administered and scored in a consistent, or "standard", manner. Standardized - one size fits all - tests are theoretically designed in such a way that the questions, conditions for administering, scoring procedures, and interpretations are consistent and are administered and scored in a predetermined, standard manner. The chief indicator by which most public schools and educators are judged today is student performance on standardized tests. 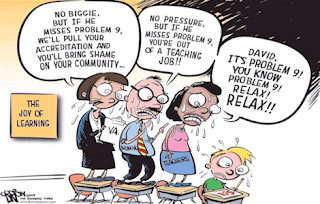 If a school's standardized test scores are low, the school's teachers and staff are judged to be ineffective. Standardized test scores are what state legislators who allocate public school funding today rely on to evaluate public school performance levels. Test scores determine not just how much funding public school districts and individual schools within districts get, but which public schools are allowed to stay open and which are closed and then turned over to charter school corporations to operate. Test scores are also used to hire, fire, and compensate teachers. Today, 35 states require teacher evaluations to include these scores as a factor—and many states have introduced new tests just for this purpose. Test scores are also used to determine whether students can move on to middle and high school, be admitted to Honors and AP programs, and graduate from high school. Republican Rep. Sam Johnson (R Tx. ), the chairman of the Ways and Means Social Security subcommittee announced in December his "plan to permanently cut save Social Security." Johnson's Social Security Reform Act of 2016 (H.R. 6489) includes cuts Republicans have been impatient to enact for decades. Johnson bill violates candidate Donald Trump's firm promise to protect the program. But members of President Trump's new administration are not only on board with the Republican plan to cut Social Security benefit checks, they strongly favor privatizing Social Security. Change the method for calculating inflation so the program's cost of living adjustments rise according to chained CPI, a far less generous metric than the current law’s inflation index. Other cuts come in the form of means-testing requirements, or on limits on what spouses or other auxiliary beneficiaries can receive. Those who participate in protest marches must take the next steps to define actual demands and priorities for candidates to take to voters in 2018-20. They must work every day to help those candidates win their elections. It can be done. If you don't think it can, just remember the tea party did it during the last President's first mid-term in office. 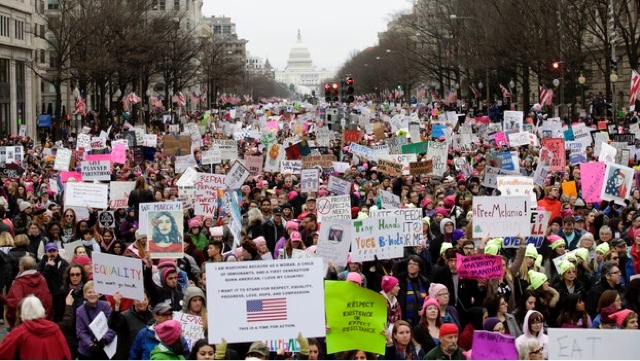 But without a path from protest to power, the Women's March will end up like Occupy. It is exciting when a protest meme leaps from social networks to the streets, capturing the imagination of millions. But it is all too easy to succumb to the false hope that a big splashy protest march is a transformative tsunami that leads to ballot box victory on election day. A big splashy protest march is only the first step on the long and often difficult road to winning elections. Democrats have about 90 weeks until early voting starts for the Nov 2018 election. Activists at the county and neighborhood levels must work every week to identify every Dem leaning voting age citizen, documenting their contact and demographic info. As Democratic leaning people are identified, county level organizations must plan and execute programs that build relationships with those people to make them an active part of the Democratic base. Those programs must be designed to invite that disconnected part of the electorate to participate in regular conversations at house and town hall meetings, and on social media. Democrats must do old fashioned base building work, and learn how to combine Internet and mobile communication with those traditional community organizing activities to accomplish that mission. In the realm of political plays, it does seem that the most important number for Democrats in the near term is Democrats need gain only 24 U.S. House seats to be the majority in that chamber. As the majority party, Democrats can block legislation, conduct investigations, and more to limit the GOP agenda, and perhaps set the stage for bigger gains in 2020. It's do-able in a wave year - maybe a pro-women wave election year. When they meet on February 23–26, 2017, the 447 members of the Democratic National Committee will elect a new chair. They will signal whether or not the party will boldly begin to transform itself back into the party of New Deals and Great Societies sought by the new generation of Democrats. Those 400-plus voting members of the DNC must take stock of the need to strike a bold new direction to reverse the party's losses. This group of DNC voting members is dominated by state party chairs and political appointees, and overlaps substantially with the super-delegates from the 2016 Democratic primary. Party insiders estimate that roughly two-thirds of the DNC members supported former Secretary of State Hillary Clinton over Sen. Bernie Sanders (I-Vt.) during that race. And Democrats face a more challenging election map in 2018 than they faced in 2016. Survival of the Democratic Party is literally on the line. Watch FB live stream video of the five candidates already running for DNC Chair address committee persons at the Texas State Democratic Executive Committee (SDEC) meeting on Saturday, December 17, 2016. Click Here to watch Huffington Post's January 18th DNC candidate forum live stream video.